Let our professional landscapers keep your property looking perfect with our landscape products. We provide delivery and landscape installation services. We offer exceptional landscape and hardscape services for residential and commercial customers. Our hardscape contractors are the best in the industry. Whether you need us to install pavers, walkways, patios, driveways or creative wall designs, our hardscaping services get the job done. Hilltop Landscape Products in Bath, Pennsylvania, is proud to be your source for the quality landscaping products and services you need. Since serving Nazareth, Macungie and the surrounding Lehigh Valley, our experts have understood that you want your landscaping experience to be convenient and efficient. That’s why we offer a wide selection of landscape products. So if you are looking for superior quality landscape products, trust the true professionals at Hilltop Landscaping to deliver. No matter your ideal landscape approach, we have a colored mulch to match whatever you desire. See our selection. Our ideas come to life when planning with our customers with these products for their sidewalks, patios, driveways and retaining walls. We offer a beautiful variety of stone products to fit your budget and vision. 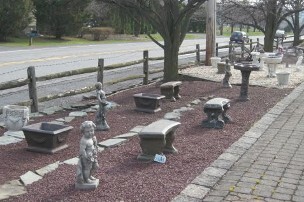 Add a special touch to your garden oasis with one of our statuary items. Each item is made of quality, durable material built to last. Our exceptional assortment of plants will truly add color and life to your landscape design. Incorporate decorative shrubbery and accent bushes to add a unique element to your outdoor escape. We offer supervised installation of any product purchased from Hilltop Landscape. Every installation in fully managed and operated by our hands-on owner who has 30+ years experience in the field. Allow our team of skilled experts to put in place your vision, supplying superior results and curb appeal. For product prices, please visit our price list and care guide. Contact us in Bath, Pennsylvania, and start to accent your property with our landscaping products and services today.